Home > Protect Your Belongings > Protecting Your Home - What Steps Can You Take? A home is a castle – but not if the drawbridge is down…. 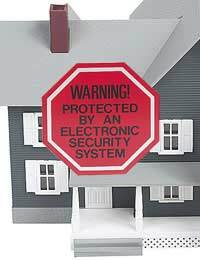 Alarms come in two basic types – those that simply make a sound when activated and those that alert a security firm. Both types are likely to deter the casual, passing burglar who would much rather work undisturbed. If a property is left unattended for prolonged periods it may be worth investing in a system with security back-up because people often ignore ringing alarms. All doors should be fitted with a five lever mortise deadlock. Rim latch, or “Yale”, locks alone offer virtually no protection and can quickly and easily be opened without a key. If the doors have proper locks and the spare keys are hidden away a burglar will not be able to use the door to remove items even he does manage to break in through a window. The door itself should be robust – glass will offer less protection than a solid door. Security bars can be used to make glass more secure and toughened or laminated glass can also be fitted. Wooden doors should be sound – rotten wood can easily be kicked in. Chains and spy-holes offer additional security if the door has to be opened to strangers. Special care should be taken to ensure that patio doors have proper locking systems and that they cannot be lifted out of their tracks. French windows can also be especially prone to attack – each door should have its own independent lock. The letterbox can allow burglars to look inside for valuables or even reach in to open the door or retrieve items which have been left near by. It may be worth fitting a cage, or other system, which will restrict access through the letterbox. All windows should have individual locks and be kept locked when not in use. Keys should not be left in the locks as this would allow the window to be easily opened by breaking the glass. Any window which is large enough to get a human head through is big enough for a burglar to use to gain access to the property. Lights fitted outside the property will serve a dual purpose. An opportunistic burglar will be reluctant to spend time trying to break in if he is well lit whilst at work. Lighting will also mean that householders returning home are less likely to be surprised by someone hiding in the dark. Infra-red sensors can be fitted so that lights only come on when someone approaches the property. These can offer useful protection but can also come with risks. A prickly hedge planted around a garden may be enough to stop all but the most determined burglar from getting in. However, bushes and trees should not obscure the front door as this will keep a burglar hidden while he tries to break in. Similarly, trees with over-hanging branches could allow a burglar to gain access through an upstairs window or make it easier to get over a garden wall. Walls should be well built, solid and, at least, about six feet or two metres high. Trellis fencing can be used to add extra height and should not be strong enough to support the weight of a human body. If there is a gate leading to the back of a property this should be kept locked. Many burglars gain access through the back of properties because they are less likely to be spotted there than at the front of a house. Garages may contain all sorts of valuable items such as tools, bicycles and garden equipment – not to mention cars. They should be kept locked at all times. If there is a door leading from the garage directly into the property this should be fitted with a proper lock so that burglars cannot walk straight into the house if they do manage to get into the garage. Garden sheds may also contain items that would appeal to burglars and should, therefore, be locked. Both sheds and garages may be used to store tools and ladders that a burglar could use to break in. The last thing a householder will want to do is provide a burglar with the means of getting into their home.